Railroads used several logos over their years of operation. These signs contain many of the logos used by several American Railroads. Historic Logos of the Baltimore & Ohio Railroad throughout its many years of operation. Sign featuring historic logos that make up todays BNSF Railway. Sign featuring historic logos used by the Chicago, Burlington & Quincy Railroad during it long existence. Sign featuring historic railroad logos that make up todays Canadian National Railroad. Sign featuring historic logos of the railroads that made up CONRAIL. Sign featuring historic logos of railroads that make up todays CSX Railroad. Sign featuring historic logos used by the Great Northern Railroad during it long existence. Sign featuring historic logos used by the Illinois Central Railroad during it long existence. Sign featuring historic logos used by the Missouri Pacific Railroad during it long existence. Sign featuring historic logos that make up the Norfolk Southern Railroad today. Sign featuring historic logos used by the Pennsylvania Railroad during it long existence. 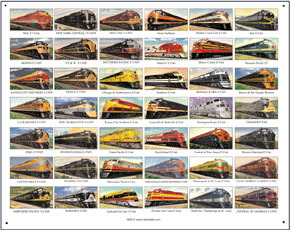 50 plus historic railroad logos most of which are fallen flags. You'll admire the beautiful colors and designs created by Americas Railroads in an age before everything was computer generated. Sign featuring historic logos used by the Aitchison, Topeka & Santa Fe Railroad during it long existence. Sign featuring historic logos of railroads that make up todays Union Pacific Railroad.